Malawi - Verification of asylum seekers in Luwani Refugee camp which started on 14 March was concluded on 24 March 2017. 3,073 individuals from the camp were verified. The remaining 462 may have returned spontaneously to Mozambique. A biometric verification exercise started in Luwani refugee camp on March 14, 2017. The exercise is aimed at ensuring an improvement in the delivery of protection and assistance to Mozambican asylum seekers by updating their data to include occupation, skills, languages, education and specific needs. In consequence, UNHCR and the Government of Malawi will have accurate data on the most vulnerable, and will thus be better placed to target protection and assistance programs for persons with specific needs. As part of the verification exercise, the biometric information of each individuals is fully captured including fingerprint and Iris. Biometric data ensures that the identity of the person is safely stored over time thus guaranteeing protection and assistance to the person entitled thereto, as well as reliable and accurate statistics. All persons of concern verified, will be issued with family documents and new laminated ration cards. Since December 9, Government of Zimbabwe and UNHCR have relocated 628 PoC from the border areas of Chipinge District to Tongogara camp. They all have been bio-metrically registered and provided with proof of registration together with the 17 Mozambican who arrived spontaneously. UNHCR and Government of Malawi registered 107 new arrivals in 40 families from Mozambique between 5 and 9 December, 2016. The majority comes from Ncondedzi and Ndande villages in Moatize district, Tete Province. A total number of 3,007 asylum seekers are currently in Luwani Refugee Camp. 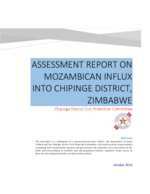 Relocation of Mozambicans from the border areas of Chipinge District continues. Government of Zimbabwe and UNHCR have moved over 260 individuals since December 9. A forth convoy is expected to arrive to Tongogara camp today. The Government of Zimbabwe and UNHCR started relocation of Mozambican asylum seekers from the border areas in Chipenge District. On December 9, 86 passengers moved to Tongogara camp with the first convoy: majority are women and children. They will be registered upon arrival to the camp, receive core relief items and allocated with a plot. A second convoy is scheduled for December 10.